Considering the style of game of our opponent is just one more step to improve our game. We have to understand that we cannot play the same style of game for all our opponents. Every game you must play different, so you don’t become the typical predictable player. An unpredictable player has better chances to win a match, it’s difficult to read what are you going to do. A night full of exciting table tennis matches last Wednesday on the Equal Challenge Tournament. Beng Loh against Ron Arellano, it was a complete battle on table #3, Ron was 2-0 down, and from nowhere he came back to make it 2-2. At the end Ron figure out how to play against Beng. and the next match will not be easy at all! Great match after all! See you this Wednesday at 6:30 pm for more table tennis! 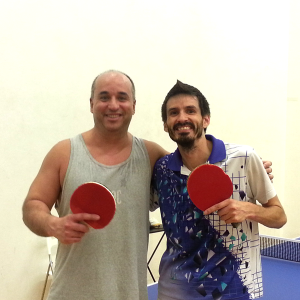 Also don’t forgot about our intermedia table tennis group lessons every Wednesday at 5:00 pm to 6:30 pm! Table tennis player since 11 years old, Marketing Director, Graphic Designer, Web Designer and now very proud organizer of the Equal Challenge in Newport Beach. What is The Table Tennis Equal Challenge Tournament?